Lumos has something wrong with him again. Poor guy! It started last Friday when he threw up. We realized it had to do with a hair ball. But, call us dense, having dealt with hairballs in the past, we weren’t too worried. 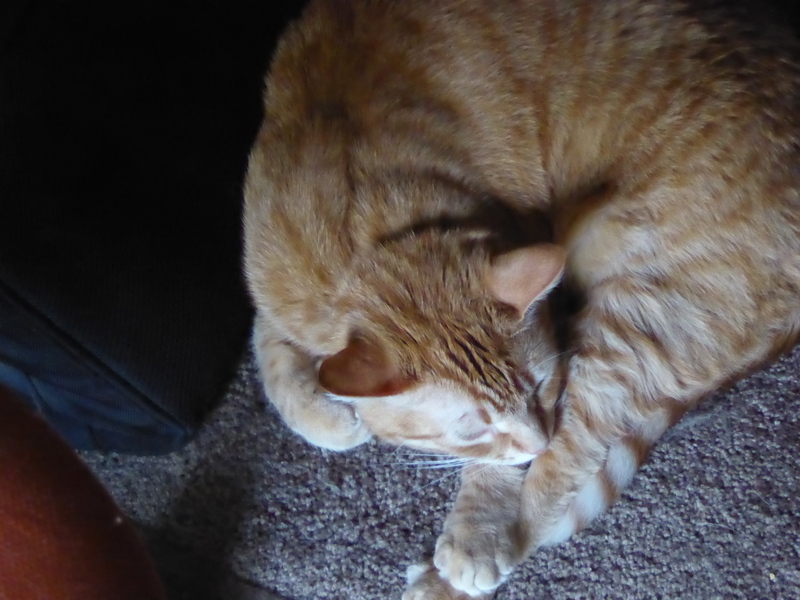 By Sunday evening, we were all down on the hairball, however, and decided if he exhibited the kind of throwing up he had been doing again, we would take him to the vet. I checked this morning and Lumos was still pink, so I called the vet and made an appointment. Then he proceeded to throw up his entire breakfast. Sigh. I am sure hoping the vet can sort out these wildly disparate symptoms and figure out what is wrong with poor Lu. The hairball/throwing up may have nothing to do with the itching and scratching, and foot grooming and pink face. Who knows. I just hope we can get it all figured out! Update: Lumos had a fever when we went to the doctor. In addition to blood work, I asked for an xray to insure there was no blockage in his intestines. There did not appear to be, I am happy to report. Right now, the doctor believes it may be a food sensitivity causing his problems, but we will know more when the blood tests come back. Cross your fingers it isn’t feline leukemia or FIV. If it is, he would have had to get that in the few weeks he was in the wild before we found him and his brother.